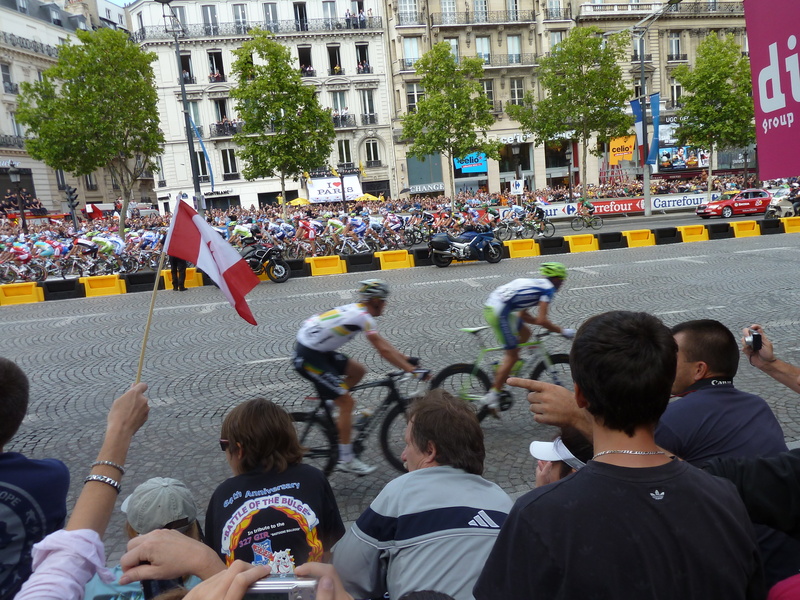 Yesterday was the finish of the Tour de France. Hundreds of riders from across the world spent weeks pushing their bodies to the limit fighting up the jagged mountains of southern France and jostling for position in tightly packed pelotons. 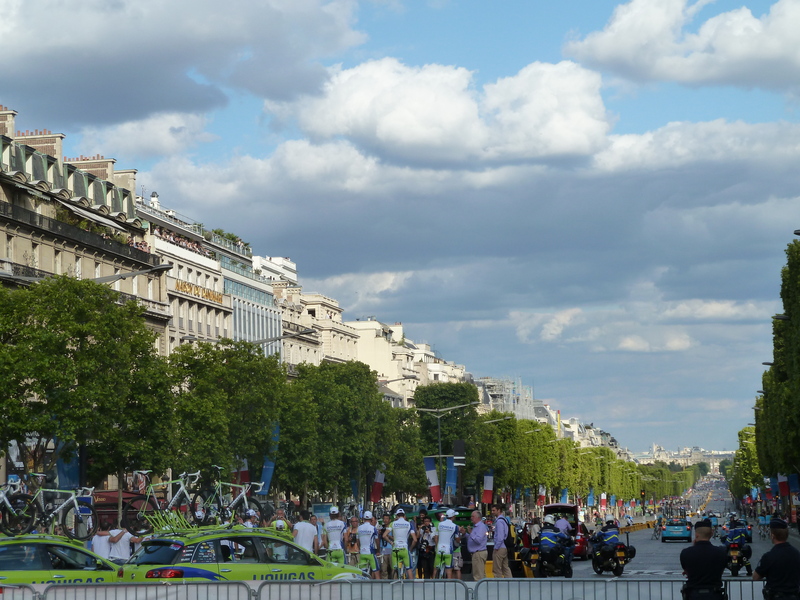 This captivating test of endurance came to an elegant close on the cobblestones of the Champs-Élysées in the shadow of the Arc de Triomphe while throngs of spectators pushed as close as they could to the race course barricades hoping to catch just a few glimpses of the lean, world-class riders. Sean and I were among the masses eagerly awaiting the riders in the hot afternoon sun, but only days before we had been the ones cycling down this famous street. We got caught in an afternoon rain storm and the slick, uneven cobblestones caused us to be far more cautious, conscious of our speed, and, at moments, a little unsure of our ability to handle a sudden stop. 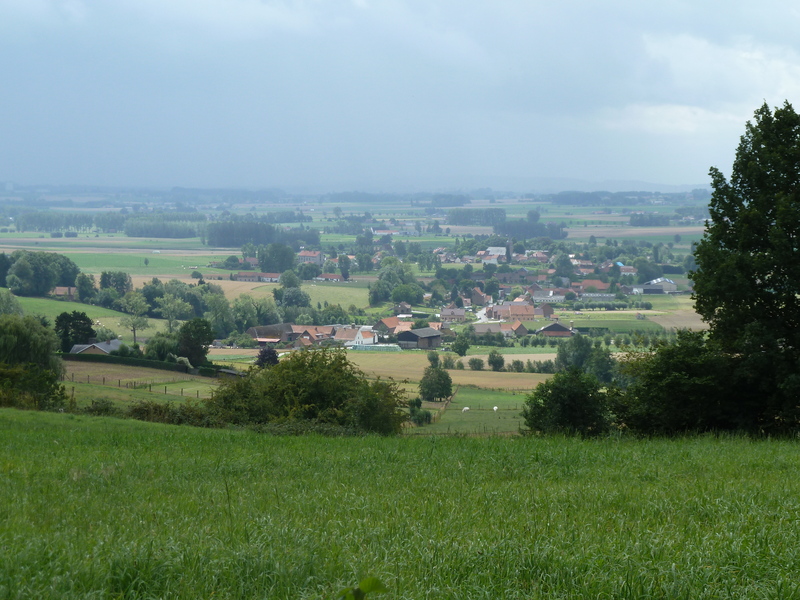 Our rainy preview of the course made us glad that the riders had a dry, sunny race day—a rarity during what has been an abnormally wet July in northern France. 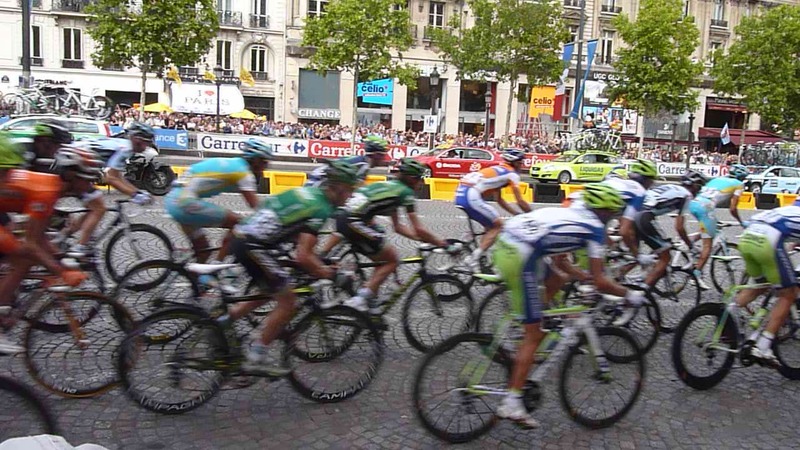 The riders arrived in Paris around 4 PM and we watched the peloton make eight flawless turns around a tight corner as they lapped the Champs-Élysées. At the end of the race we congratulated the proud Australian fans cheering next to us on Cadel Evans’ victory—the first Australian Tour de France winner ever. Evans and yesterday’s stage winner Mark Cavedesh of England weren’t the only riders being celebrated. Each finisher had accomplished an amazing feat and the riders energetically signed autographs for doting fans leaning over the barricades and posed for dozens of pictures in front of the Arc de Triomphe. The small children of several racers rode side-saddle on the crossbars of their father’s sleek racing bikes during the victory lap, likely feeling a sense of awe that their parent had suddenly transformed into a celebrated hero for the day. End of race photo shoot of the Liquid Gas team. After a full day of Tour festivities we were glad to escape the tide of spectators fanning out across the city in the early evening by hopping on our bikes and crossing the Seine River to the peaceful Saint Germaine neighborhood. We celebrated Sean’s last day of vacation and the end of our own tour to Paris by enjoying—and maybe even slightly over indulging in—the French epicurean tradition of a multi-course meal lasting several hours. We decided over dinner that one of our favorite parts of our cycle tour was the constant challenge of navigation. Holland and Northern Belgium use the same node system I described in a previous post. A series of about 20 node numbers selected on a map prior to beginning your ride can guide you for most of the day without needing to consult a map—as long as you don’t miss any node signs. Before we left Amsterdam Sean found a node route holder that can be attached to your front handlebars and we took turns reminding each other what node number we should be looking for. As you can see, we made some mid-route changes to our plan. The signs for the nodes were abundant in some regions and sparse in other parts—we’d lose the route at least a few times a day and then have to figure out where we went wrong. We were both uncertain about which direction the route went at one intersection in southern Holland and just as we pulled out our map a man pulled up to the curb in a truck and asked us if he could help us find our way. It turned out he was responsible for maintaining the node number signs and he happened to be in the middle of updating the section we were cycling through. It was fortuitous that he arrived when he did! In Brussels we stopped in at the European Cycling Federation (ECF), a cycling research and advocacy organization partially funded by the European Union. We spent about 20 minutes talking with Ed Lancaster the policy officer for ECF responsible for cycle tourism initiatives. Ed spends most of his time working on the EuroVelo project, an initiative started ten years ago to create high quality cycling routes that will connect all the countries in Europe. There are currently 12 Eurovelo routes and Sean and I spent a few days on the North Sea route while we were in Belgium. The benefit of these routes is that you don’t need to select nodes—you can simply follow the same route signs for an entire tour. Ed’s challenge is that he is coordinating with dozens of different representatives across Europe and getting consistent EuroVelo signage across the continent is extremely difficult. We didn’t actually see any EuroVelo signs yet while we were on the route and instead followed the Belgium long distance cycle routes signs—some of which will soon be accompanied by EuroVelo signs as well. Ed is hopeful that the EuroVelo signs will be in place on several of the routes in the coming years so that signage will be consistent as cyclists move from one country to the next. 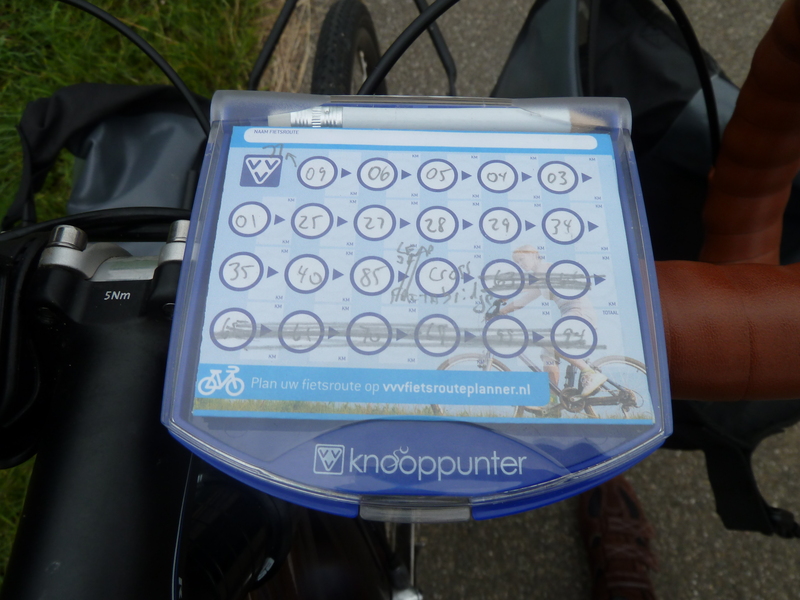 Cycle touring isn’t the most efficient way to get from city to city and touring routes are usually not direct. The cycle routes are meant to be scenic and as a result we would find ourselves zigzagging through small towns, farmland, and forests. Cycle touring allows you to sightsee and explore all day. Unlike taking a train or driving, arriving at your destination isn’t the exciting part of the day. The exciting part of the day is climbing on your bike and anticipating where the route will take you. 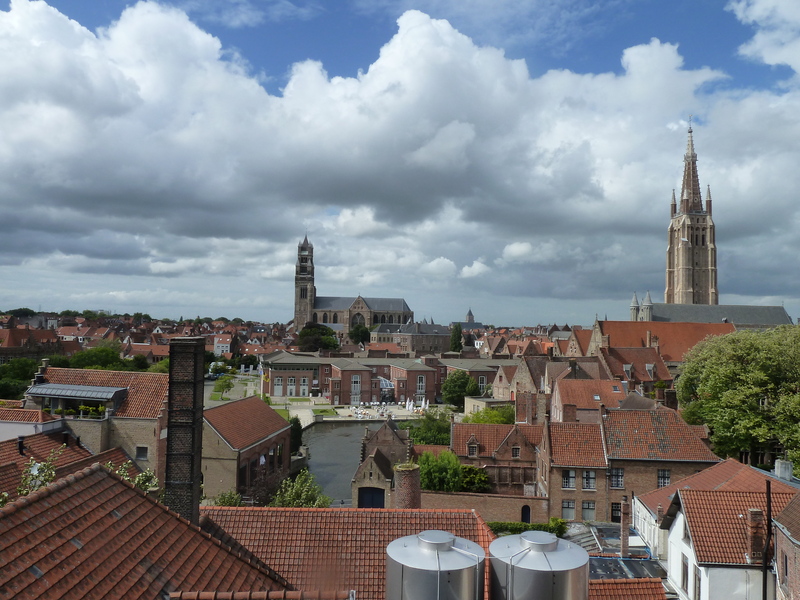 View from the top of the De Halve Mann brewery in Bruges, Belgium. That said, these circuitous routes added a lot more mileage to our trip and necessitated taking trains for a few legs of the journey. 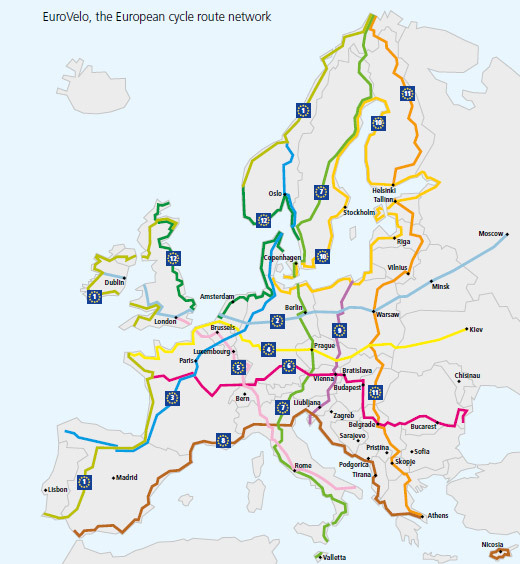 Ed’s work on EuroVelo also includes lobbying to have bicycles allowed on all trains throughout Europe. I’ve learned firsthand over the last two months that cycle touring is a lot more enjoyable if you have a back-up train option. Trains make sense when the weather turns, joints get stiff, or people need to catch return flights home. 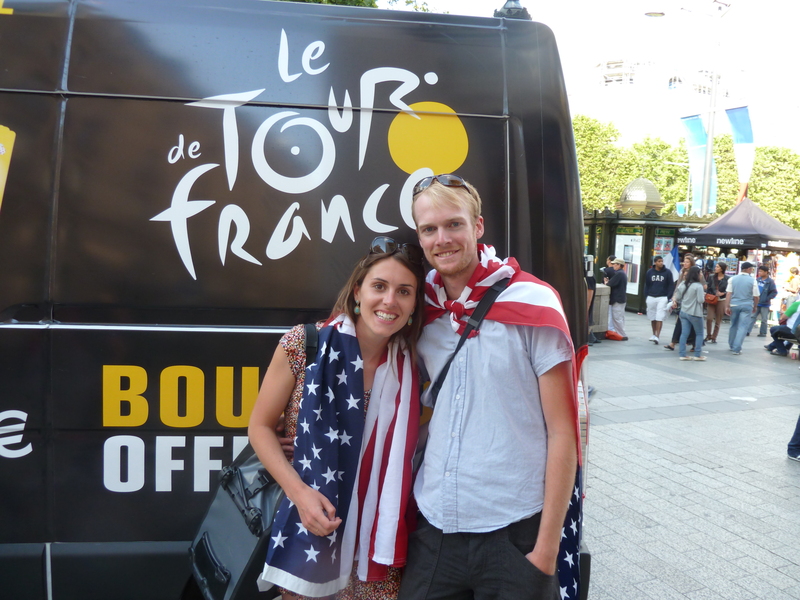 Le Tour de France and Sean’s tour of Holland, Belgium, and France have both come to an end in Paris—but my tour continues on. I’ll be in Paris until the end of the week and then will begin riding to Switzerland to explore Basel and Zurich. I’m signing off now to try out Paris’ Vélib’ bike share program. More updates coming soon!